To export a Déjà Vu X3 Translation Memory to text you must open the Translation Memory you want to export in Déjà Vu X3, then access the menu option File>Export>File or Database. 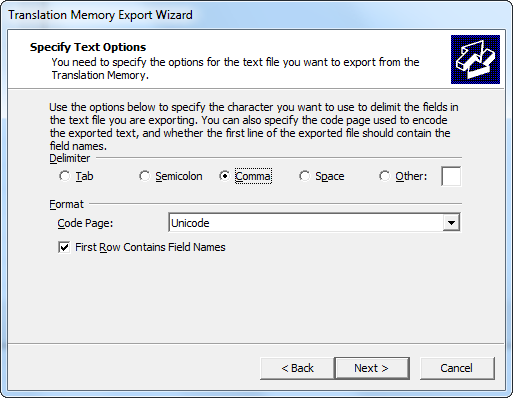 In the wizard that appears you should select Text as the output format, and continue. Eventually, you will get to the part of the Wizard in which you are asked to specify what fields the exported file should contain. The fields that are most commonly used are the source language field and the target language field, which will contain the source language sentences and their translations. In Déjà Vu X3 you can export several more fields, such as the date or the subject of each exported sentence, if you wish. To add a new field, click on the button labelled Add, and a new empty field will be created. In order for Déjà Vu X3 to be able to use this field to create a new file, you must specify certain information for the field. 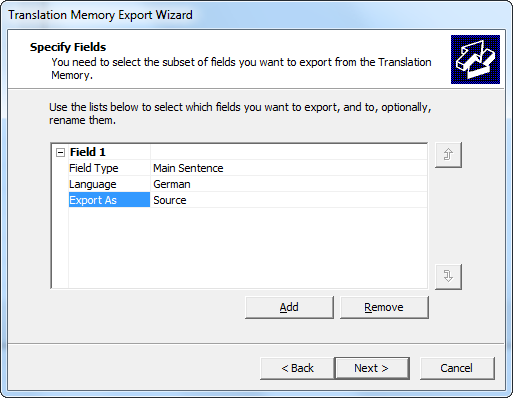 In the example shown below, we select the value Main Sentence for the Field Type out of the available options, we select German as the Language, and we type the word Source for the Export As option. This will tell Déjà Vu X3 to export sentences in German, treating them as the source language, and the column created for them in the resulting text file will be labelled Source. Then, add a new field which will contain the translations. For this, click on Add again. 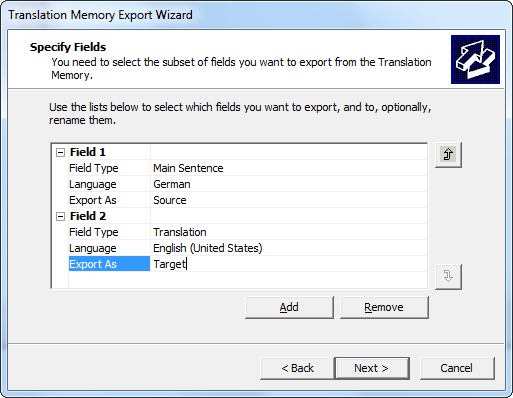 In the new field, we select Translation as the Field Type, English (United States) as the Language, and we type Target in the Export As option. This will tell Déjà Vu X3 to create a new field which will contain the translations for the sentences placed in the Main Sentence field, and that these sentences will be taken from the English language sentences contained in the Déjà Vu X3 Translation Memory. It will also tell Déjà Vu X3 to label this field Target in the resulting Text file. After this, click on next and you will get to the part of the Wizard where you must specify what separator to use. The Comma is a commonly used separator; using it will result in Déjà Vu X3 creating what is called a CSV file, which can be read by many programs. Another commonly used separator is the Tab, which makes the resulting Text file easier to read. Once you have specified the separator you want to use, you can continue to the end of the wizard. Déjà Vu X3 will then create a Text file that will contain each source sentence followed by its translation. Each source-target pair will be on its own line, and the source and target sentences will be separated by the separator you selected.